When a project is delivered to the Museum, we process the collection. 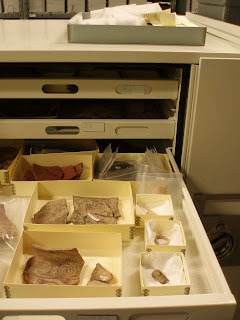 The majority of the artifacts are things like bags of sherds, lithics and soil samples, those end up in our “research collection” which are inventoried, entered in our database then stored in boxes awaiting that special archaeologist who needs the samples for future research. Artifacts that are particularly interesting either because of what they are or where they were found end up in our cataloged collection where they receive additional levels of documentation. 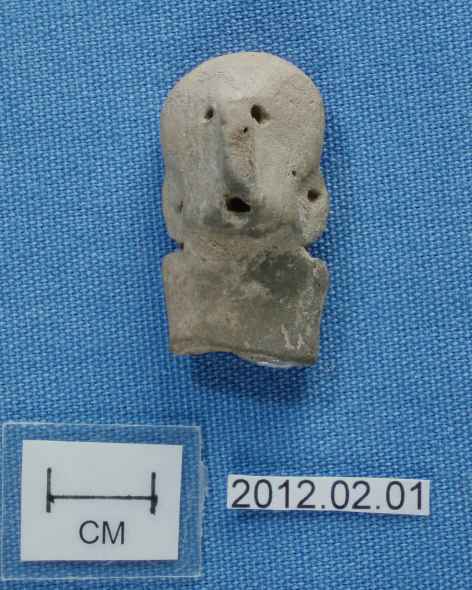 After identifying the object for cataloging, the first step is to assign the artifact a unique number. 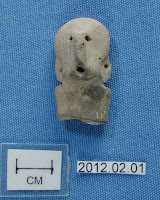 ﻿﻿ The back of this figurine fragment is labeled with a piece of acid-free paper, printed on a laser printer. The label is sandwiched between coats of a water-soluble conservation quality adhesive. 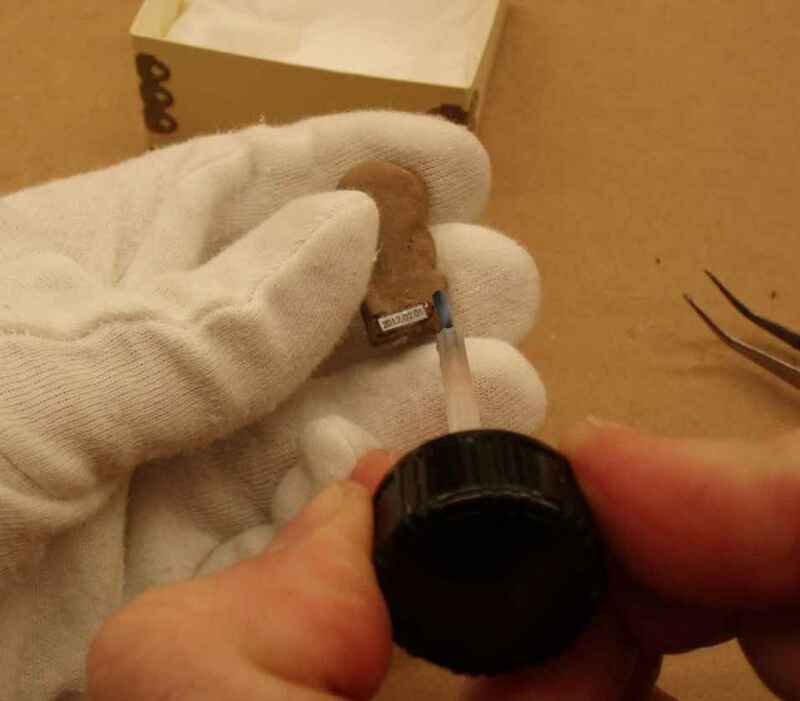 After the label dries the process to document the artifact begins. The first step is measuring. This helps to reduce future handling of the artifact, allowing staff and researchers to refer to the measurements for determining storage needs or space requirements in future exhibits. The measurements are entered into a catalog card in our database. We also enter information about when and where the artifact was found. Finally we write a verbal description of the artifact. Having a catalog card allows us to keep track of the artifact and refer to the database for information rather than examining the artifact every time information about it is requested. ﻿We also document the artifact visually. 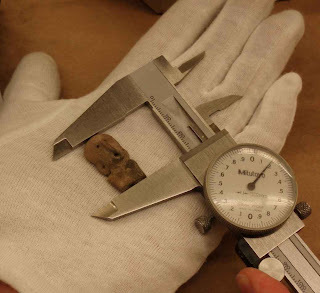 Most of our artifacts at PGM are relatively small. We use a small table covered with blue fabric as the background for most of our pictures. 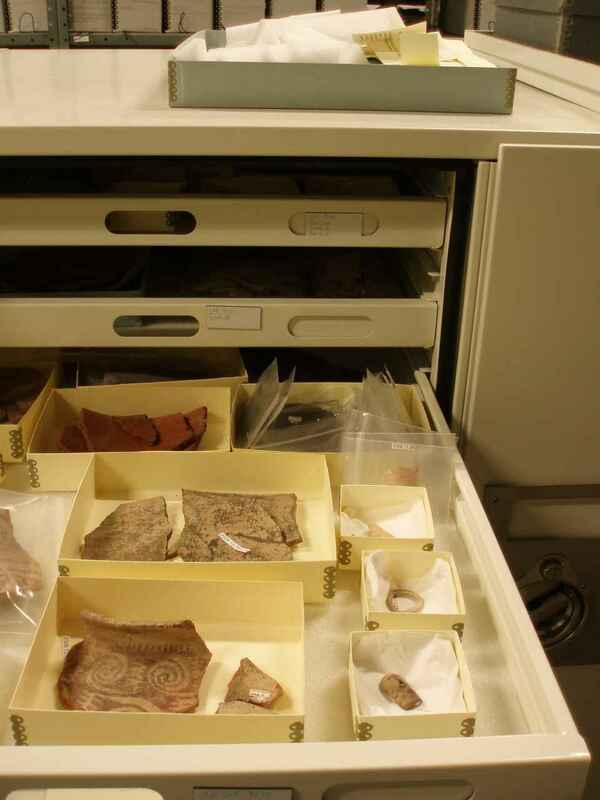 A scale and a catalog number are placed with the artifact. The photograph is the last step to give us a complete reference for the object. If a researcher or a staff member requests information about the artifact, we can pull up the image and send information from the catalog card. 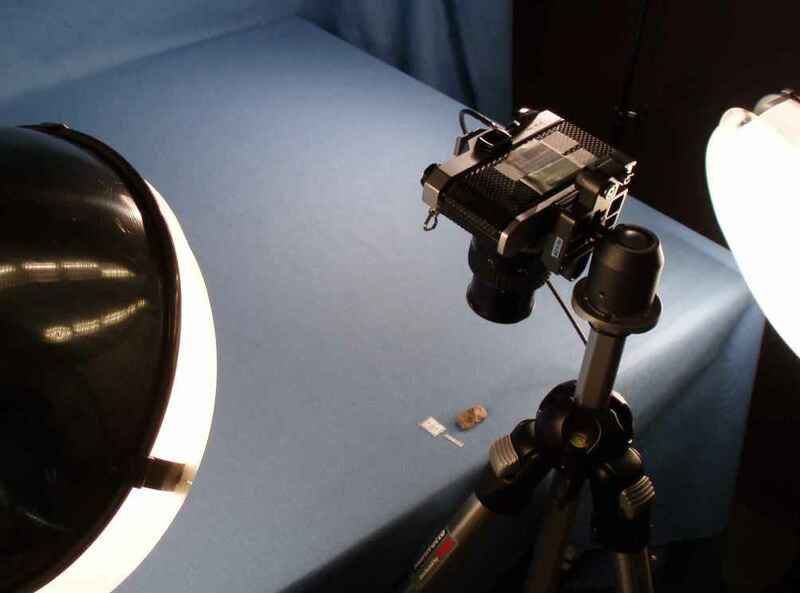 These completed cataloging steps help to reduce potential damage to the figurine which can be caused by frequent movement or clumsy handling. Once cataloging is complete we find a storage location for the artifact. This figurine is small enough to go in one of our cabinets located in our collections storage vault. This room is environmentally controlled with a constant temperature of 65 degrees and 35% humidity. The stable environment helps to reduce stress to the object, further aiding in its preservation. The figurine will remain in the cabinet awaiting a researcher or the chance to be displayed in an exhibit.